Welcome to February’s Progress Report! This month saw smaller number of contributions from our regular developers as most of the improvements were still a work-in-progress that required further tweaking before they could be merged in the upcoming months. That’s not to say this February didn’t have big improvements though. On the contrary, this month kd-11 finally implemented the much anticipated On-Screen Keyboard while GalCiv managed to emulate multiple PlayStation 3 accessories using regular controllers. If that wasn’t enough, thanks to the multiple other performance improvements to the emulator, exclusive titles such as Genji: Days of the Blade have seen a huge uplift in performance. 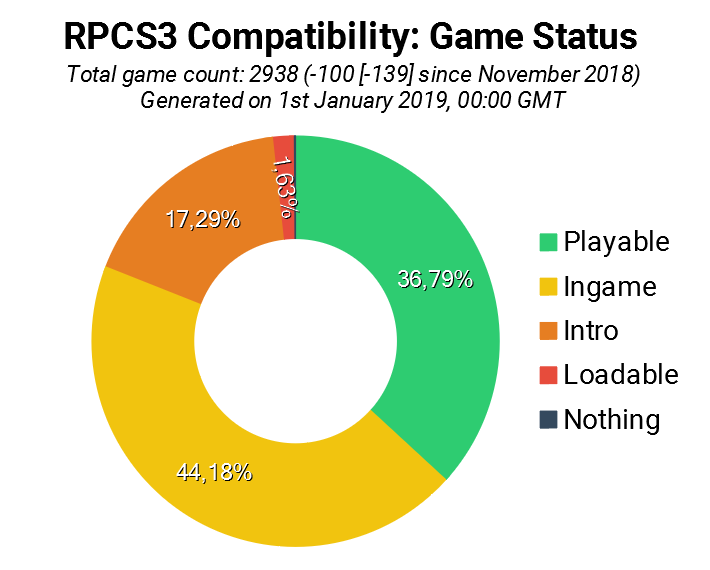 This month saw RPCS3 reach another milestone in game compatibility with the Ingame and Playable categories cumulatively crossing 85%! 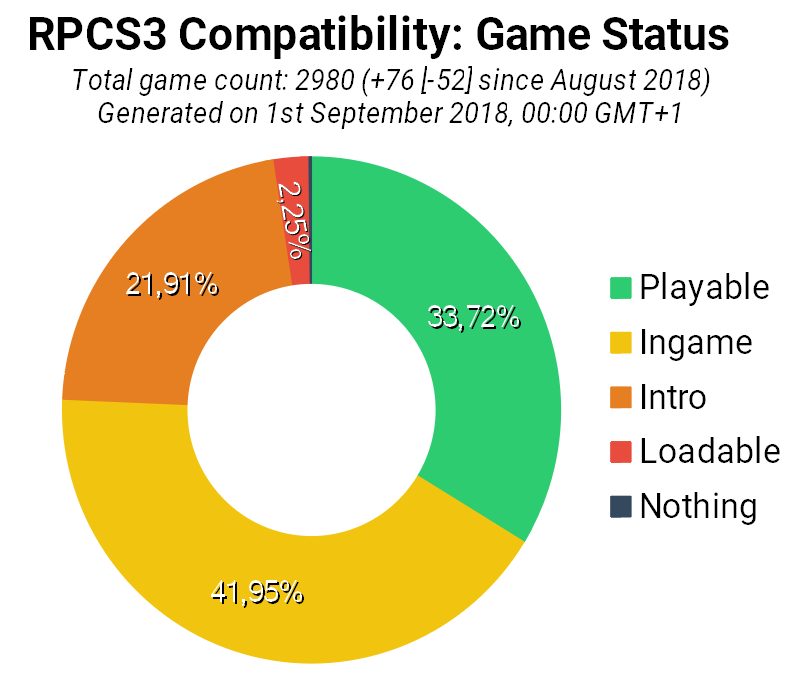 This was largely thanks to the conscious efforts of testers to retest all games in Intro, Loadable and Nothing categories and report issues faced to the developers. Once provided relevant causes, our developers were able to fix issues plaguing many of these titles. Their efforts paid off with the Intro category decreasing by 66 titles. But this is just the beginning, with further work being done to improve these titles. On Git statistics, there have been 2209 lines of code added and 447 removed through 21 pull requests by 9 authors. Welcome to the January 2019 progress report! 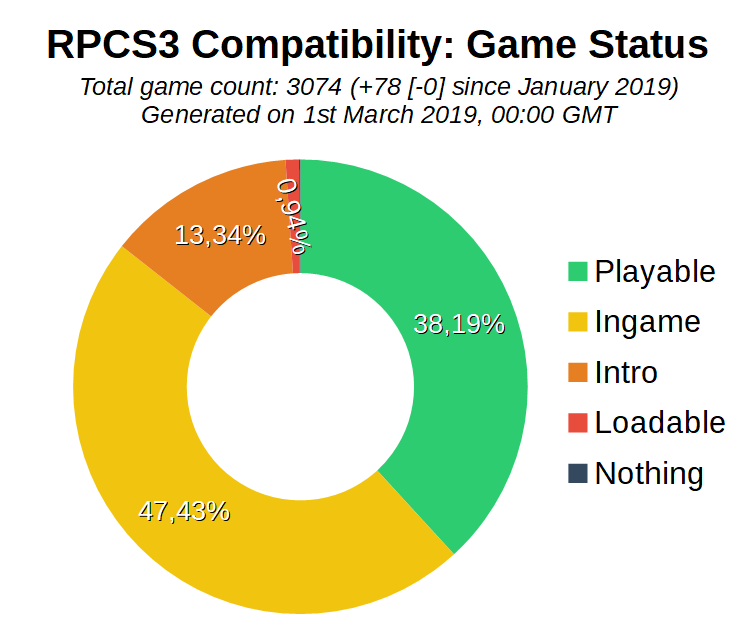 This month saw significant improvements to the core components of RPCS3 such as the introduction of multithreaded cache compilation for the SPU LLVM recompiler, reimplementation of the graphics framebuffer management, overhaul of the audio backend and much more. We also saw RPCS3’s version bump to 0.0.6 to better showcase the state of the emulator. Over at our forums, a few user and moderators have come together to acquire and test titles that have not been tested recently. Our developers have also been hard at work debugging niche issues that seem to prevent a few titles from progressing ingame. 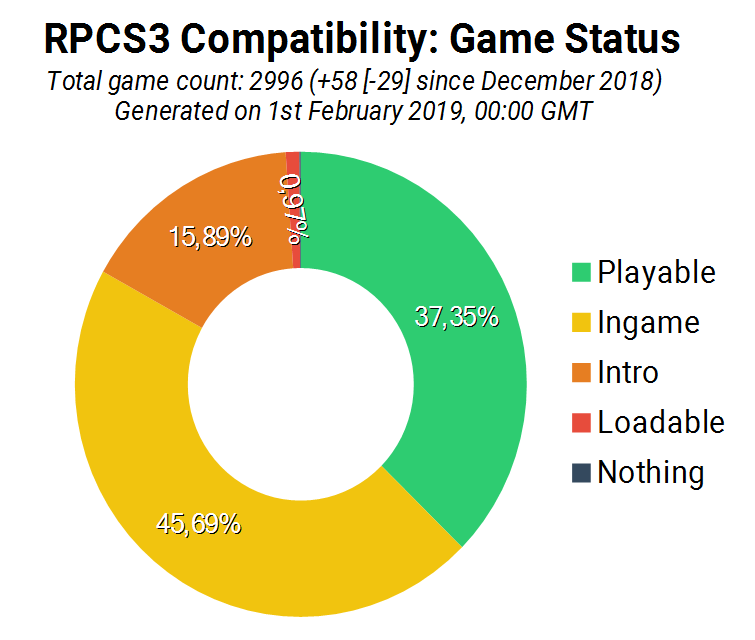 The results of their targeted efforts gives us veracious compatibility statistics from which we can see a big decrease in Intro and Loadable categories and a corresponding increase to Playable and Ingame categories. On Git statistics, there have been 8179 lines of code added and 5073 removed through 36 pull requests by 9 authors. Welcome to our (2018) December Progress Report! We are extremely happy to finally push this report out to you guys after the many delays, for which we tried to make up with other kinds of updates along the way. We hope that you’ll enjoy our deep dive about the last month of the past year, and find its stories equally as intriguing. December has been an absolute whirlwind for RPCS3 with improvements made to various parts of the emulator. Nekotekina greatly improved performance with the introduction of Approximate xfloat while kd-11 fixed a wide variety of graphical issues affecting multiple AAA titles. Apart from our full-time developers, our regular contributors also made a plethora of improvements to the texture cache predictor, cellCamera emulation, controller/mouse support, GUI and tons of bug fixes. We’ve tried to detail as many as we possibly could in this report. So without further ado, let get into it! This month saw improvements to various aspects of the emulator and the compatibility list is no exception. At the start of 2018, the compatibility list was revamped to allow us to merge multiple game IDs for the same game into one single entry. This helped reduce duplication of entries and enhance the quality of the statistics we provide. While we were able to merge IDs of different regions together, due to the way the compatibility list database was structured, titles with multiple IDs from the same region could not be merged and hence were shown as separate entries. Not wanting to leave the job half done, AniLeo refactored the compatibility list once again this month to now allow us to merge IDs from the same region as well! With this change, we can eliminate unnecessary duplication entirely and significantly improve the quality of our statistics to properly represent the amazing progress made with the emulator. If you take a look at the metrics for this month, you will notice that the number of games has decreased across all categories. This is solely due to the above mentioned revamp of the compatibility list. 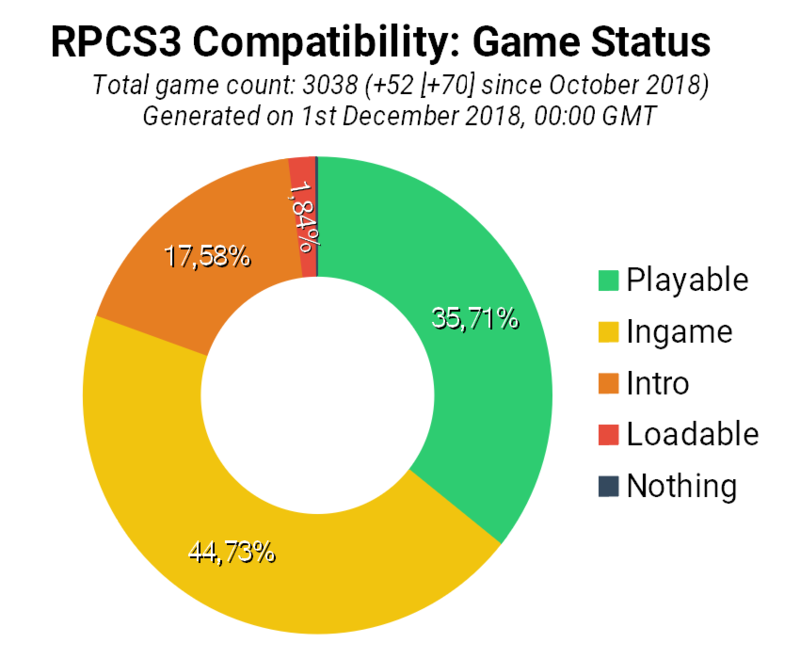 However, if you take a look at the compatibility history page, we can see that the Playable category has increased by over 15 titles and Ingame category has increase by over 30 new titles. The nothing category also reduced by one, bringing the total to just 3 titles! On Git statistics, there have been 4,802 lines of code added and 2,530 removed through 105 commits by 18 authors. Welcome to November’s Progress Report! As 2018 now comes to close, we hope you’re enjoying the holiday season. In this report, we will be detailing kd-11’s work on rewriting the FIFO and draw call processing which provides a noticeable improvement in performance in quite a few games. This month also saw the return of another long-time contributor, GalCiv whose contributions fixed a large number of regressions in multiple games. We also saw exclusive titles such as Gran Turismo 5 and MLB: The Show 16 go ingame for the first time on RPCS3. We’ve got lots to share so let’s jump straight into it! For the first time, the percentage of games in the Ingame and Playable categories have risen above 80%. 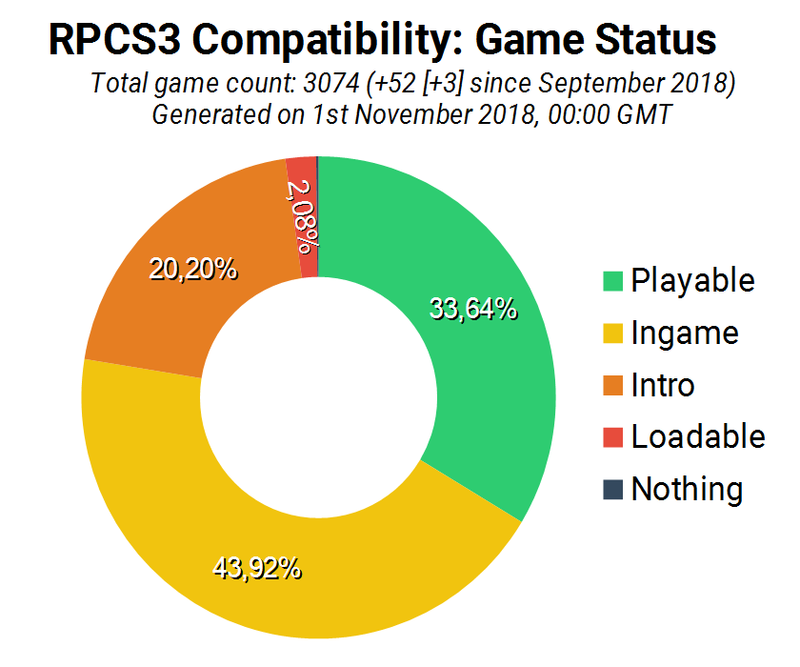 This marks yet another milestone in game compatibility for RPCS3. As the accuracy and performance improves, we will see this ratio improve even further! Thanks to the intensive testing done by our testers this month, 95 games were moved out of Intro and Loadable categories. Also, multiple duplicate titles across all categories were identified and merged, improving the overall accuracy of the compatibility list. Finally, the elusive Nothing category has dropped to just 4 games. For a more detailed look, you can view the compatibility history page to see exactly which games had their status changed this month. On Git statistics, there have been 4,229 lines of code added and 1,843 removed through 30 pull requests by 11 authors. Welcome to October’s Progress Report! Thankfully, there have been no major delays in publishing this time around, and we hope to continue gradually closing the gap even further in the future. On the other hand, since both of our main developers were busy this month doing heavy refactors and rewrites in the background, not all of the changes are ready to be showed off just yet. While Nekotekina’s current efforts aren’t about yielding direct and spectacular changes to begin with, we did do a write-up about kd’s changes and another graphics related PR from ruipin here in the Upcoming section below. This isn’t to say that October was without any changes, as one entry of a cult-classic and previously PlayStation exclusive AAA series, Yakuza, just hit playable this month! For this, and more, let’s dive in and see what happened during the month! Looking at the compatibility database, we can see the numbers continue to move in the right direction at a slow, but steady pace. Around 60 new games have been added to the Ingame and Playable categories, and several has transitioned up between those. Also, with the consistent bug fixes and accuracy improvements, our developers and contributors continue to chip away the Intro and Loadable categories, as well as improve the games of other categories. For further details, take a look at the compatibility history page to see which games in particular had their status’ changed during the month. On Git statistics, there have been 4,128 lines of code added and 2,583 removed through 30 pull requests by 8 authors. Welcome to September’s progress report! Firstly, we would like to apologize for the delay. Our progress reports are written by voluntary writers and sadly most of them were unavailable to contribute this month. However, there is a silver lining here. The additional time we had gave us a unique opportunity to convert this month’s progress report into a technical exposition hybrid! We’ll be featuring a deep dive into the inner workings of the texture cache in RPCS3, and how it was improved thanks to the contributions of ruipin and Nekotekina. We will also uncover the wide variety of improvements that kd-11 made and showcase some massive improvements to various AAA titles. Without further ado, let’s jump straight into September’s irregular progress report! In the compatibility database statistics, we can see all the numbers moving further in the right direction. 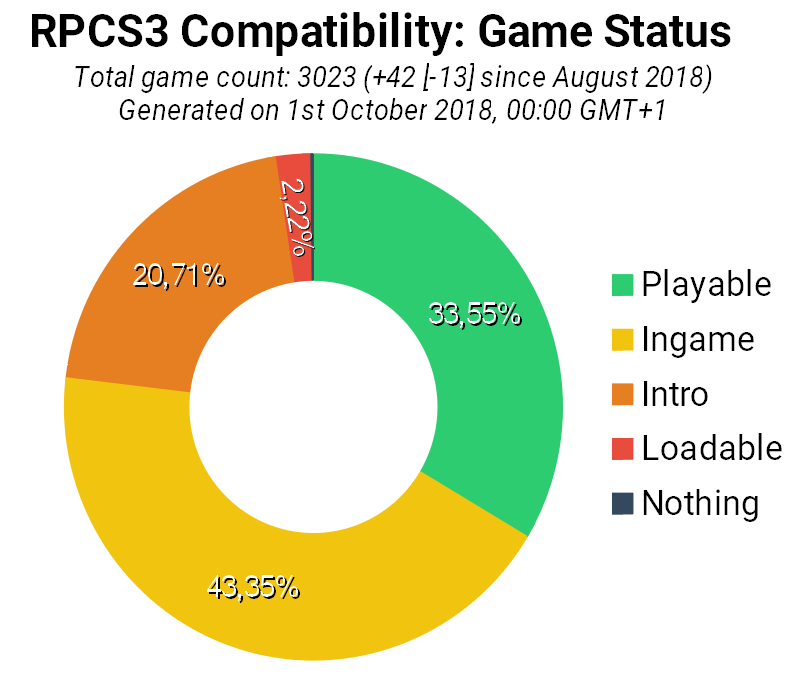 The Ingame category has breached the 1300 games barrier while Playable continues to slowly raise due to the amount of time it takes to make a playable compatibility report. Intro also saw a decent reduction as a result of recent improvements and lots of testers making compatibility reports. For more details, take a look at the compatibility history page, to see which games in particular had their status’ changed during the month. On Git statistics, there have been 10,178 lines of code added and 6,751 removed through 53 pull requests by 12 authors. 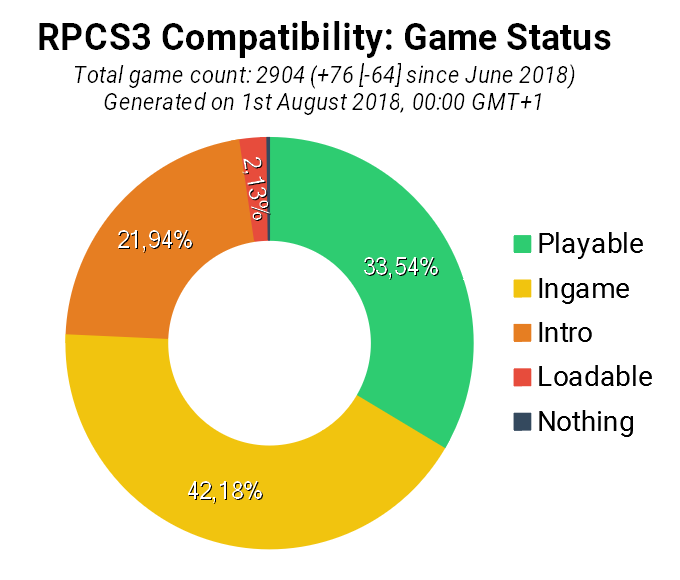 August has been an amazing month for RPCS3 as we crossed multiple new milestones. This month saw massive performance improvements to many AAA titles, accuracy and performance enhancements to SPU LLVM, support for C++ 2017, laying the foundation for macOS support and much more! The Playable category has finally crossed 1,000 titles milestone! Considering that this time last year, the Playable category was only a little over 400, it truly demonstrates the amazing pace of development. For all other categories, we can see the metrics moving in the right direction with the elusive Nothing category dropping by 1, with only 5 games remaining in it. For a more detailed look, you can view the compatibility history page to see exactly which games had their status changed this month. On Git statistics, there have been 7,086 lines of code added and 4,298 removed through 127 commits by 21 authors. This month has seen major improvements to the SPU LLVM recompiler and RSX emulation as well as implementation of new features such as a user manager and a refreshed UI design, among many other improvements and additions. On Git statistics, there have been 8 047 lines of code added and 4 671 removed through 135 commits by 12 authors. Continue reading Eliminating Stutter with Asynchronous Shader Implementation! On compatibility database statistics, we can see a big decrease in Loadable games due to several recent changes targeting issues that kept those games from progressing further. The Nothing category also went down by 2 games, with only 6 games remaining in it. On Git statistics, there have been 16 605 lines of code added and 10 558 removed through 135 commits by 21 authors.